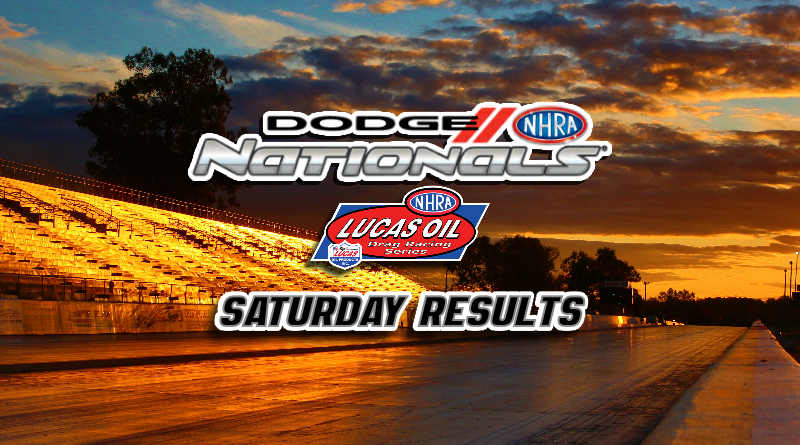 MOHNTON, Pa. – After three rounds of competition on Saturday, only three competitors remain in each of the four sportsman classes at Maple Grove Raceway. With an odd number of cars, we already know one of the final round competitors in each class as four competitors have scheduled bye runs in tomorrow’s semifinal round. See below for individual class updates. After three rounds of competition on Saturday, only Anthony Bertozzi, Anthony Bongiovanni, and Brittany Boltz remain in Super Stock. Bongiovanni will be looking to win his second national event of the season as his semifinal bye run will place him in the final round on Sunday afternoon. Bertozzi and Boltz will meet in the other half of the semifinals to see who will race Bongiovanni for the win. Bongiovanni has looked strong this weekend as he defeated numerous big name drivers such as Dan Fletcher, former Jeg’s Allstar champ James Antonette, and A. Lincoln Moorehead through the first three rounds. The DragChamp pick’em is still alive as Bertozzi is still in competition. Boltz took out my other pick, Pete D’Agnolo, in the third round after D’Agnolo took .034 stripe to breakout by -.022. Boltz was .041 and dead on 1 for the win. Like Bongiovanni, Bertozzi will be chasing his second national event win of the year tomorrow after winning the Charlotte national earlier this year. In Stock, two of my picks went head-to-head in round four as Anthony Fetch defeated a red-lighting Joe Santangelo (-.001). Fetch will face Donald Moulton in the semifinal round and Shane Oakes will have the bye into the final round. Fetch is the last DragChamp pick’em competitor standing in Stock Eliminator and hopefully will find his way to victory on Sunday. The Devin Isenhower express was finally derailed on Saturday as he lost a double-breakout race by .003 in the third round against Howie Smith. Smith posted a .008 light and an 8.896 to take down Isenhower’s game .020, 8.893. Mike Robilotto is carrying the flag in the DragChamp pick’em as he continued to stay hot on Saturday. Robilotto took a close 8.914 to 8.891 breakout win over no. 1 qualifier Kenneth Moses in the fourth round. The semifinal bye will go to Chris Garretson in his 130 mph dragster. With his final round appearance Garretson will jump to the lead in the national championship points chase. Garretson has been .03 at the tree in each of the first four rounds but has made up for it with consistent 8.90 and 8.91 passes. Because his mph is so much slower than the rest of the field, Garretson has benefitted from his opponents mistakes at the finish line. Dale Koncen has the bye to the final in Sunday’s semifinal round of Super Gas while Ray Sawyer will battle Jason Kenny to determine the other half of the final round. The win streak ends at 10 rounds for Devin Isenhower. After winning INDY, Isenhower made another late run at Reading lasting until the fourth round where he lost to Division 1 hitter Jason Kenny. After even lights, both drivers plowed the brakes at the stripe with Kenny posting a winning 9.917 to defeat Isenhower’s 9.934 by four feet. Ray Sawyer is the fourth DragChamp pick’em racer to make the semifinals this week. That leaves me with one competitor in every class so we could go 4 for 4 on Sunday which would be a cool follow-up to the U.S. Nationals where my Super Gas pick, Devin Isenhower, pulled out the victory. So far so good, we’ll see what Sunday brings. Check back tomorrow as we’ll have coverage of all of the sportsman class final rounds. DragChamp is your source for NHRA sportsman racing news online. Check back daily for the latest drag racing news and sportsman racing updates from around the country.